TROUT ANGLERS owe Al Caucci a debt of gratitude. Just two examples of what he’s done for us: the Comparadun dry fly and the Hatches books (all created with the late Bob Nastasi). These contributions alone assure that Caucci’s and Nastasi’s names will be included on any short list of innovative and influential trout anglers. And now Caucci has put out this great book: A compact guide to identifying mayfly nymphs, duns and spinners entitled The Mayfly Guide. It’s small enough to fit in a vest pocket, its pages are waterproof and it is perfect for a fishing road trip. This book is pure utility. There is no purple prose, and not a single story of how Caucci correctly identified some unexpected mayfly and so saved an otherwise fishless day. A statement regarding the Ephemerellidae family on page 44—“These hardy and prolific insects are the most awesome of all mayfly families both in number and importance”—is as juicy as it gets. There are no distractions from the task of identifying mayflies. The book is structured like a narrative flowchart: If “x” then “y,” and if “y” then “z.” The whole system is linear and elegant. An example: If the nymph you’re looking at has tusks, it’s a burrower; go to page 15. On page 15, you’ll find drawings and descriptions detailing each relevant genus’s defining characteristics. Once you’ve figured out the mayfly’s genus, you’re directed to subsequent pages to determine its species. And just like that, you know what the bug in question will look like in each of its stages. This helps, of course, in choosing an accurate imitation, and then fishing it at the right time and in the right place. 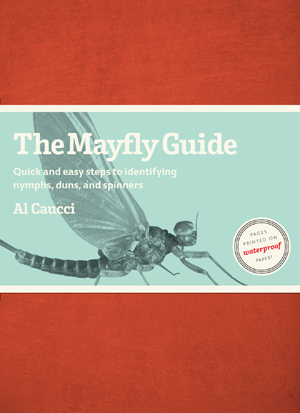 The Mayfly Guide streamlines mayfly identification in a way I’ve never seen. The book was meant to be an on-the-water reference, but, its main utility isn’t as an on-stream guide; I know very few anglers (“very few” = zero) who carry entomology guides with them while they’re fishing, though I guess such anglers must exist. Instead, this book’s primary virtue is that it’s a simple-to-use, practical resource for the angler who collects some mayflies and who wants to key them out as efficiently as possible back at the home lab. Let’s say that during a morning session on the river you turn over some rocks and find a bunch of active 2-tailed mayfly nymphs with dark wingpads. You anticipate that the nymphs will emerge in the afternoon. Whichever option you choose (and the choice will be dictated by your personality), The Mayfly Guide has you covered. If you’re an option (1) type, your nymph-collection efforts gave you a good handle on what to expect for the afternoon emergence. If you’re an option (2) type, you didn’t collect any nymph samples, and you don’t really know what to expect for that afternoon’s emergence. So you do your best during the hatch, carefully observe some duns, and then key them out in the evening. You’ll know what to expect for tomorrow. In either case, using this book as a guide, your mayfly identification shouldn’t take more than a half hour, tops, and there you go—you know where the pre-emergence nymphs are likely to congregate, where the duns should come off and what they’ll look like, and whether there’s a chance for a fishable spinner fall. All this from a book that measures a mere 6 ½ x 5 inches and that sports a red velourish cover. It has to be noted that The Mayfly Guide is not like the O.E.D. of mayfly entomology. It is not comprehensive. It’s a great help in identifying mayflies, but you’ll need to look at other books to learn more about them. (The book provides a selected bibliography for just this purpose.) For example, it doesn’t tell you what time of day the various mayflies are most likely to emerge, nor is there any attempt to state specifically when during a season emergences are likely to be heaviest. And there’s no fly-pattern guide. The reader has to do some figurative legwork after identifying the mayfly du jour. But this isn’t much of a complaint: The Mayfly Guide hits its target straight on. It will help you identify mayflies more quickly than any reference I know of, and I’m itching to put it to use. Buy The Mayfly Guide in the MidCurrent Store.